An ascent of Western Europe’s highest mountain is a big challenge and superb mountaineering expedition. 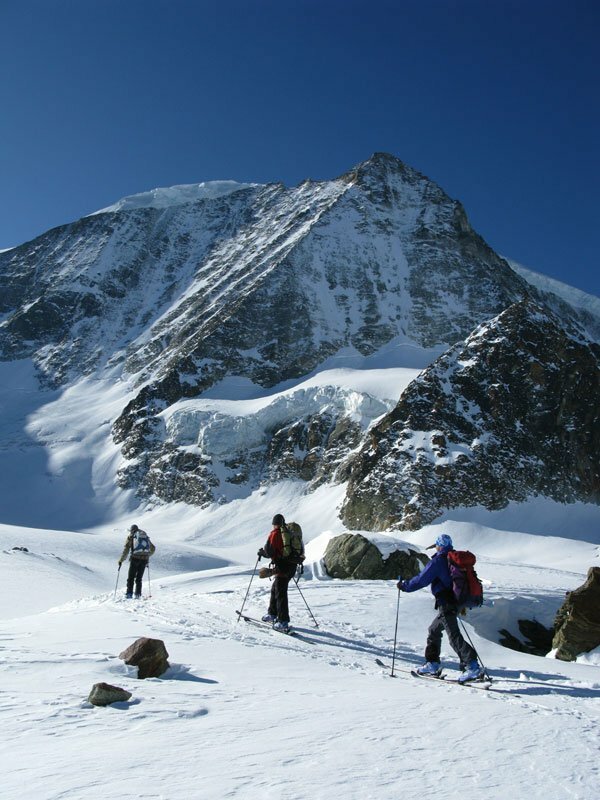 Our six day course allows time for training and acclimatisation which means you are able to enjoy the ascent and climb some other great alpine peaks along the way. 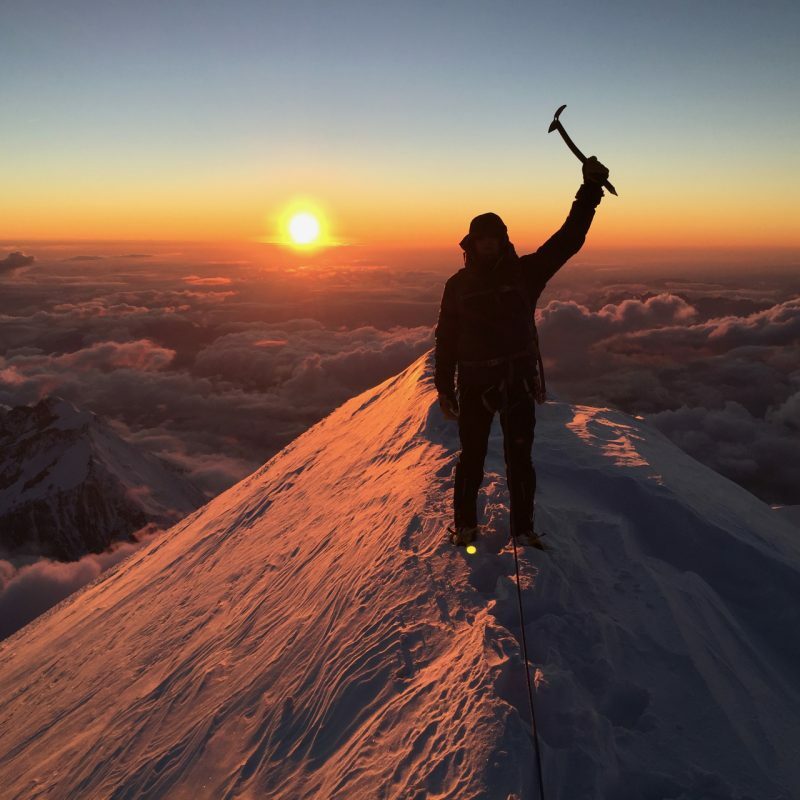 We understand the balance between preparing well and saving enough energy for the long summit day and because of this, and our first class Mountain Guides, we have an excellent summit success record on Mont Blanc. We usually aim to climb just outside the busy high summer season to give you the best experience possible on the mountain. Despite our very good track record on Mont Blanc our courses are not about dragging people to the summit. 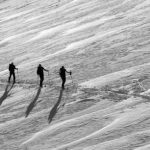 We give you a good insight in to general Alpine Mountaineering and have a fun & sociable time along the way. We run 3 day Mont Blanc summit programmes which always follow our 3 day Gran Paradiso, Weissmeis or Aiguille du Tour programmes. Or you can create your own programme with private guiding prior to joining the summit team. Location: Between the two alpine towns of Chamonix in the Haute Savoie department of France and Courmayeur in the Italian Valle d’Aoste. The summit area is entirely in France. This is a suggested itinerary based on good conditions. It may be necessary to change the programme to make best use of local mountain weather, conditions, team’s experience and availability of hut bookings. Also please note that some courses, as specified on the courses dates below, start with our 3 day Climb the Gran Paradiso or 3 day Climb The Weissmeis programme. This means that if you have already done the Gran Paradiso or another peak as part of a previous attempt, you can come back and do an alternative warm up / training / acclimatisation phase. Pre-Course: Arrive in Chamonix and check in to accomodation. Arrange any final equipment required for the week ahead, boot hire etc. Relax, enjoy the mountain atmosphere & look forward to the course. Ideally, also do some mountain walking and acclimatisation training in the hills above Chamonix for a few days before the course starts. We can offer advice on how to get the most out of these pre-course elements as well as obtaining the right equipment for the course. 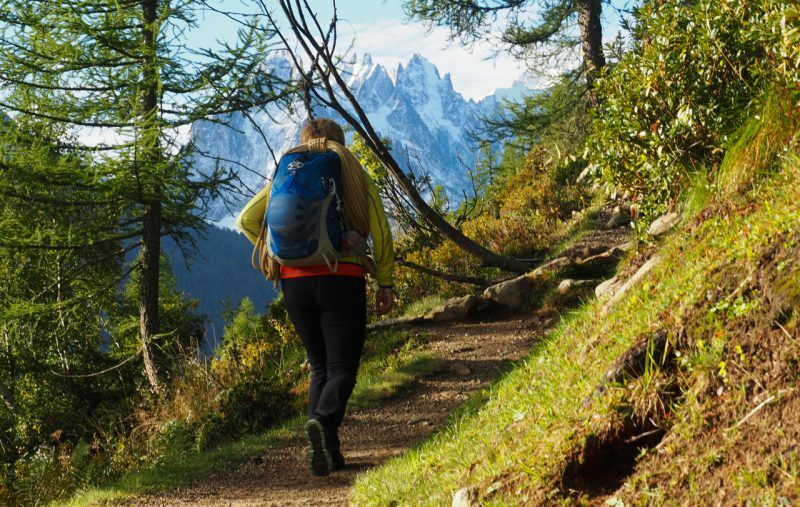 Brilliant middle mountain trails, ‘The Grand Balcons’ provide great scenic walks above the Chamonix Valley, acclimatisation and warm up for our Mont Blanc course. Day 2: A pre-dawn alpine start will hopefully give us the fantastic alpine experience of crunching over a frozen and moonlit glacier in crampons. As the sun rises we will attempt to climb one of several 3500m peaks on the French / Swiss border such as the Tête Blanche or Petite Fourche. Magnificent views sweep across the whole alpine chain from here, especially to the Matterhorn & other peaks of the Swiss Valais Alps. Our onward journey takes us in to Switzerland and on to the huge Trient Glacier. Along the way we practise the skills of roped glacier travel and discuss simple crevasse rescue procedures. By lunchtime we should be relaxing at the Trient hut, re-hydrating & refueling (with a Swiss Rösti perhaps!). A short afternoon rock scramble gives further relevant training for the ascent of Mt Blanc but the afternoon is mainly spent relaxing & acclimatising before a 2nd night sleeping at the increased altitude of 3170m. Alpine start from the Albert Premier Hut, heading for the Aiguille du Tour and a night at the Swiss Trient Hut. Aiguille du Chardonnet beyond. Eastern end of the Mont Blanc Massif. Day 4: If the weather allows, a deliberately leisurely start is made to allow maximum rest before the steady ascent of Mont Blanc begins. From Les Houches, a short drive from Chamonix,we take the Bellevue Telecabine which links to the Tramway du Mont Blanc and up to the scenic ‘Nid d’Aigle’ (Eagles Nest). From here we take our time on the short but sustained approach to the Tête Rousse Hut (3167m) spending the afternoon relaxing, sorting kit and talking through the route & strategy for tomorrow’s big summit day. Day 5: By taking breakfast at around 0400 we avoid most other groups leaving both the Tête Rousse and Gouter Huts and will usually have a much quieter time climbing the mountain and making the most of the high mountain conditions later in the day. Timings for this summit day revolve around approximately 2 hour intervals: c. 2 hours to the Gouter Hut, Another 2 hours to the Vallot Hut and just under another couple of hours from there to the summit….This is where your training pays off! The ascent of Mont Blanc provides a long and tough high mountain day and is not to be underestimated. By spending a second night on the descent of the mountain at the Gouter Hut the time pressure for the day is considerably reduced. The crossing of the Grand Couloir is made early the next morning and the summit experience can be enjoyed more than if it is rushed. After what is usually an 8 hour day we return to the hut for a meal and, usually, an early night! Day 6: After an 0700 breakfast the scrambling descent of the Gouter Ridge can be done on fresh legs and in the cool & calm of the early morning period when the Grand Couloir is crossed before the arrival of the sun.From here, all that remains is the short walk back to the Nid d’Aigle and trains / lifts down to the Chamonix Valley. However if the weather did not allow for a summit attempt yesterday this final day can also act as a 2nd possible option for the summit day. If all has gone to plan A, this last day provides an opportunity to relax and enjoy Chamonix (particularly the view back up to Mont Blanc) and have a celebratory meal in the evening. Congratulations! Hi Rob, I just wanted to say a HUGE thank you again for such a wonderful time on the Mont Blanc course and for getting me safely to the summit! I had a sensational time and am very grateful to you for leading such a fantastic week. Please do let me know if your ever over in Western Australia, I would love to buy you a drink! Can You Climb Mont Blanc? Whilst it is not necessary to be an experienced mountaineer to climb Mont Blanc with a Mountain Guide, a very good level of fitness is necessary and some strong hill walking experience will be highly beneficial. 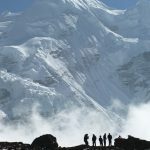 The summit day could be up to 12 hours long, at altitude, so you should be physically and mentally prepared for this very considerable challenge. By the standard routes, Mont Blanc is not a difficult technical peak but it does involve some steep rocky scrambling and folk do regularly underestimate it. You will need to arrive for your Mont Blanc course, rested but fit from months of prior training. Training in a gym does not replicate climbing a mountain so it is far preferable to spend time mountain walking and ideally on broken rocky ground with some scrambling. We can arrange training courses in both the UK & Alps to help you prepare. Running, long distance cycling or any other long endurance events will be a useful addition to the time you spend training in the mountains. Fun scrambling and physical mountain walking. 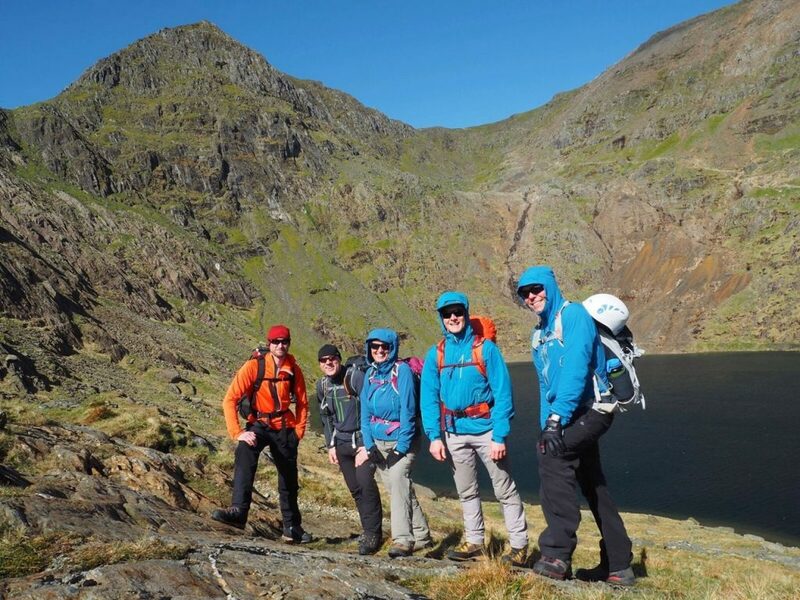 A brilliant day in Snowdonia on our Mont Blanc Training weekend. 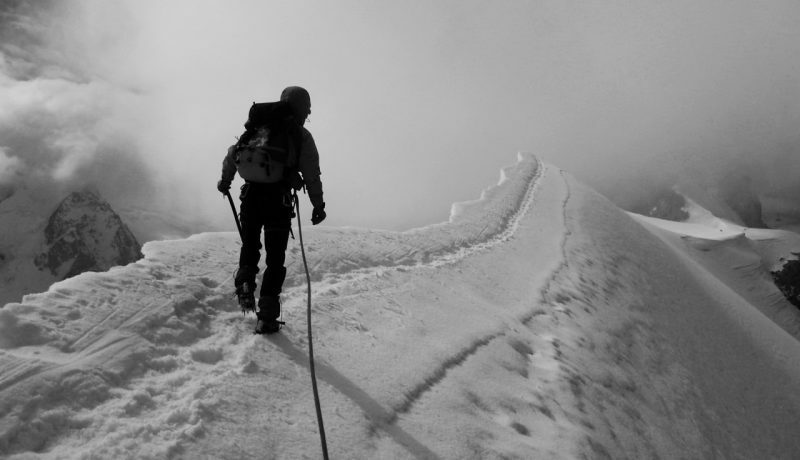 There is a tough physical reality to climbing Mont Blanc which can not be avoided with a determined mental approach. You will need the latter as well but it’s no use if you simply don’t have the legs. We are aiming to summit with some style as well as decent margin of safety and your high fitness level is perhaps the main factor in achieving this. Another factor to consider is your body weight. There is a simple reality to the fact that people with excess body weight struggle a lot more during the climb than those without. So, in addition to your training, please make sure you arrive for the ascent at a weight conducive to sporting & athletic activity – relevant to your height & build. We aim to build to the Mont Blanc ascent throughout the 6 day week. This will include an attempt on at least 1 other alpine summit and this will give a strong initial impression of your level of fitness and thus suitability for attempting the summit. Unfortunately we can not guarantee to even attempt the summit with members who do not show sufficient fitness capability during this preparation phase. For more information visit our Mont Blanc FAQ’s page. Sun rise on the technically easy but long and repetitive ascent of the Dôme du Gouter. Perhaps the mental crux of the climb. A long way to get here, a long way to go. How much training you have done will usually become clear at this point. Our Chamonix Alpine Intro course would be a great start to building your mountaineering experience and a good onward progression would then be to Climb the Gran Paradiso, followed by the Weissmies. These enjoyable and contrasting Italian & Swiss 4000m peaks would set you up very well for Climbing Mont Blanc. Your mountaineering skills play a highly significant role in the ascent of Mont Blanc, as well as your fitness and stamina. By training in Chamonix you can become much more efficient with crampons and ice axe moving over steep / exposed snow…and have fun training along the way! It’s now a couple of days since the climbs and my body is slowly recovering!! Really lucky to have been able to do Mont Blanc and the Matterhorn. Just wanted to thank you for organising the trip. All your guides were friendly, helpful and most importantly I always felt safe with them on the mountain. Maybe another adventure sometime?! Cheers, Gary. To help you prepare for your summer Mont Blanc (or similar peak) ascent programme we organise a couple of training weekends to offer some quality mountaineering training to build in around your own personal fitness and weight management schedule. 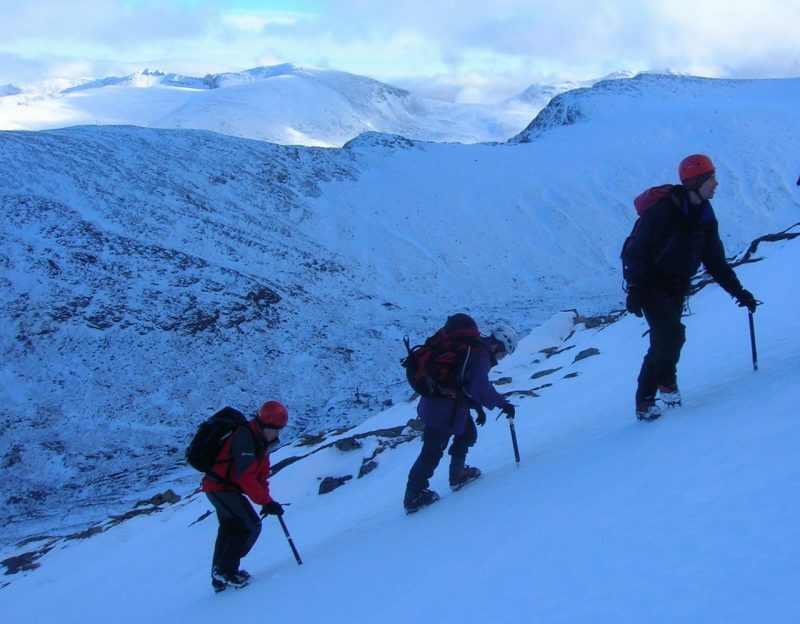 The first of these weekends is run in winter in the Scottish Highlands to give you the fundamental training in using ice axe and particularly crampons which provides the bed rock of sound high mountaineering skill. 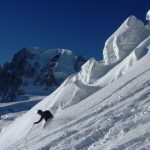 Developing these skills will greatly enhance your efficiency and enjoyment on Mont Blanc and certainly enhance your chances of summiting as it will take less energy with a more competent and confident approach to covering the mountaineering terrain involved. Ice axe and crampon training on Aonach Mor, Fort William, West Highlands. Great Mont Blanc training terrain! 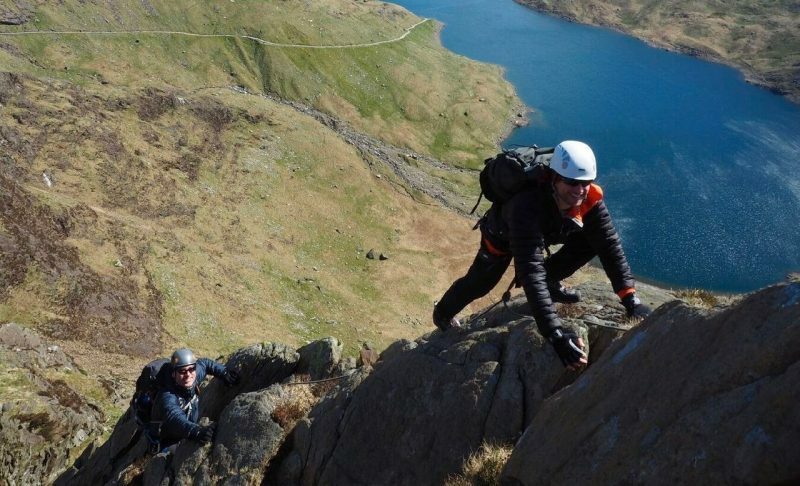 The second weekend is run in spring in Snowdonia to build in the essential rock scrambling skills which form a key part of the ascent of Mont Blanc between the Tete Rousse & Gouter Huts during the crossing of the infamous ‘Grand Couloir’ and sustained enjoyable scrambling above. 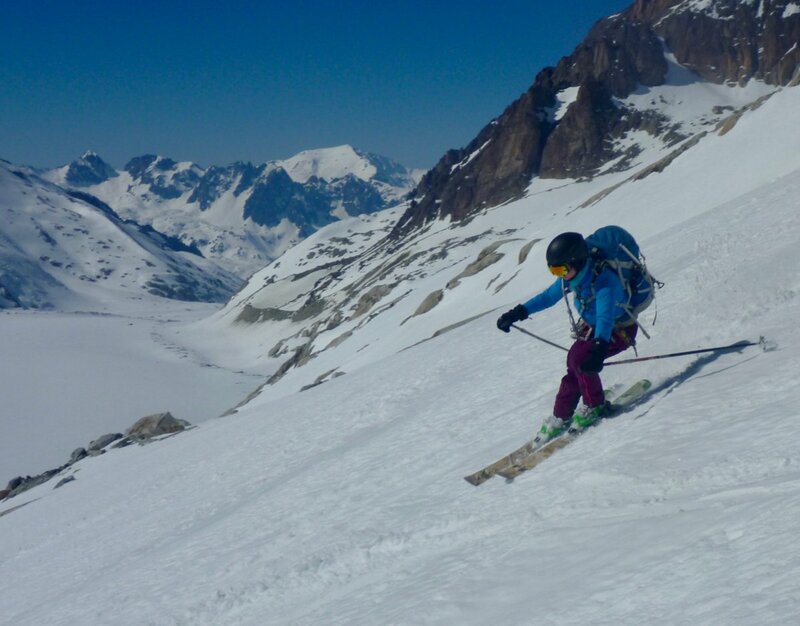 This is sometimes done in the dark and often done with tired legs on the descent, so again, practice and skill development in this area will greatly enhance your efficiency and enjoyment during the ascent and descent of Mont Blanc. Both weekends are also a good opportunity to add some crucial mountain miles to the legs as part of your training programme and improve your stamina and mountain endurance whilst having an enjoyable & sociable weekend in the mountains. It’s also a great chance to review equipment selection for Mont Blanc, ask any questions relating to any aspect of the ascent & preparation and meet some like minded other climbers. The booking of huts on Mont Blanc can be difficult! Especially at short notice when the huts may be simply full. We work hard to get the reservations most suitable for your Mont Blanc trip but in the event of this not being possible here are some strategies for climbing the mountain with an alternative plan. In the event of not being able to get the preferred hut bookings we will proceed via one of the methods described on that page, so please read it carefully as it may be relevant to your course. A Mont Blanc equipment list is given above. In addition to good quality warm mountain walking gear you will need technical equipment like; alpine mountaineering boots; crampons; ice-axe; harness and helmet. All this gear can be easily & cheaply hired from us. Check our Chamonix Mountaineering Equipment Hire. In October 2015 we climbed Mont Blanc in 1 day from Bellevue to the summit & down to the Gouter Hut for the night & a well earned rest! In tough, cool & snowy autumn conditions with C. 3100m of ascent, this was no easy path but summiting at sunset and descending to the Gouter under a star lit night was a fantastic & memorable mountain experience. With 14 hours on the go this challenge is not for the faint hearted or weak legged! 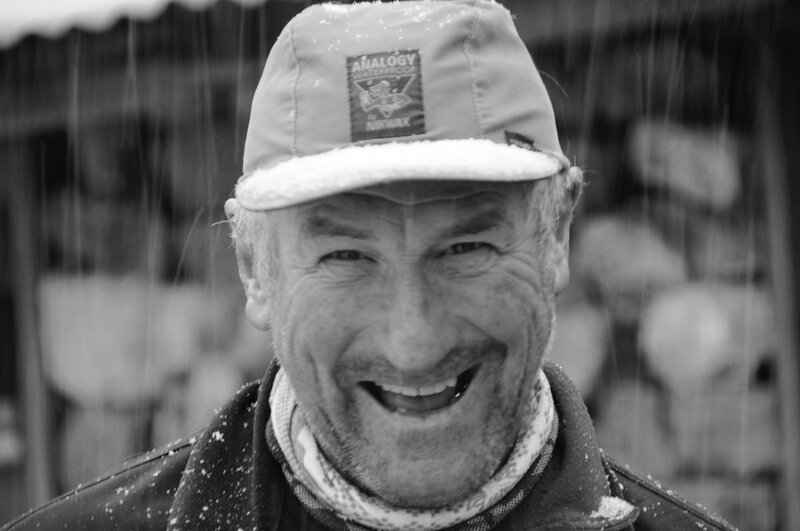 You can read more about the ascent on Paul Antrobus’ blog post here, One Day On Mont Blanc. Please note that our course dates below are either early or late summer season and start early or mid week. 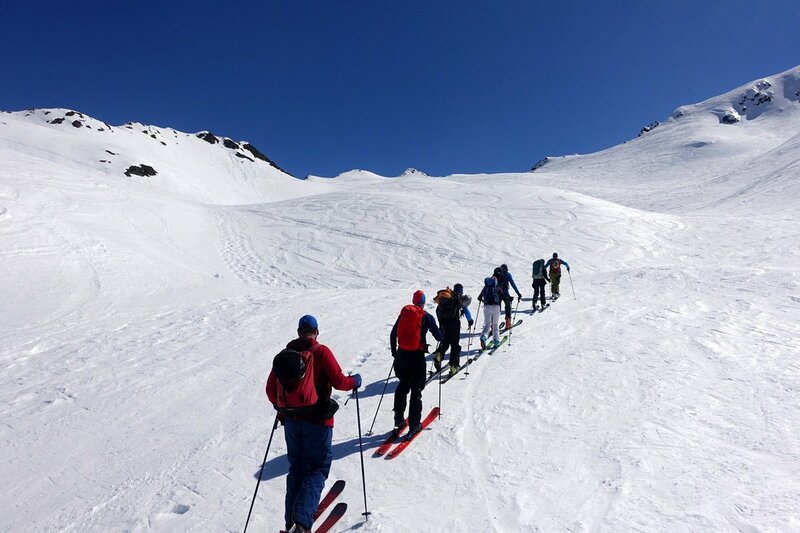 In our experience this approach helps to give you the best possible experience on the mountain in terms of conditions and avoiding the overcrowded & hot mid-summer period. Stone fall in the Grand Couloir also generally presents more of a problem in July and August than in June and September and this is another major reason why we run our courses towards the beginning and end of the summer season. Since 2011 our Climb Mont Blanc programmes have been almost a complete sell out, so please reserve your place for summer 2019 very early – both to guarantee your place & help us confirm all the necessary mountain Guide & hut bookings in good time. 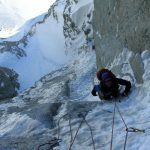 This course is well before the main summer busy period and offers the well prepared climber an inspiring opportunity to climb Mont Blanc in tougher, quieter conditions and generally before the summer heat creates excessive rock fall problems in the Grand Couloir. Whilst the Tete Rousse & Gouter Huts are open there is often still a lot of snow around and the Bellevue ski lift and Mont Blanc tramway are still closed requiring a 4×4 taxi / longer walk! 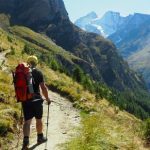 The warm up phase on this course comprises of 2 nights in Italian mountain huts with high altitude, glacier and mountaineering training as well as an early season ascent of the Gran Paradiso. There is then a day off, on the 4th June, to allow for rest and recuperation before the 3 day Mt Blanc summit period 5-7th June. Opportunity to do our Chamonix Alpine Intro or climb the Weissmeis or climb the Gran Paradiso, before this 3 day Mont Blanc summit ascent, with a rest day in-between. 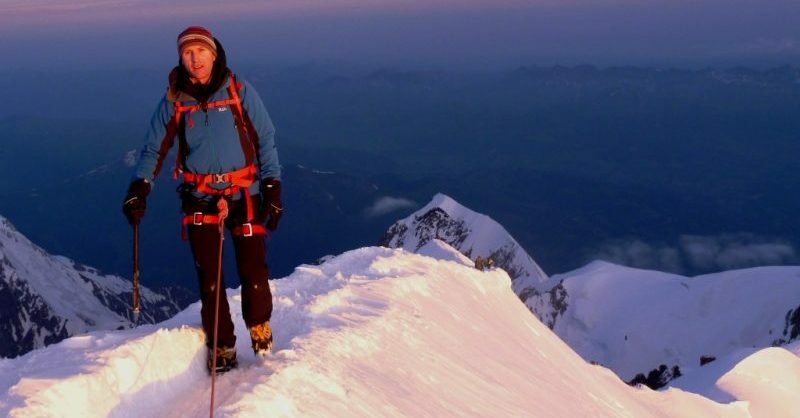 Opportunity to do our Monte Rosa Mountaineer or climb the Weissmeis or climb the Gran Paradiso, before this 3 day Mont Blanc summit ascent, with a rest day in-between. A tough but rewarding time to climb in early autumn. Lifts, trains & the Tete Rousse & Gouter huts are all shut making the approach longer and we use the Hellbroner & Midi lifts and Torino Hut in the Mont Blanc Massif to acclimatise. Traditionally we have had good success in good conditions on Mont Blanc at this time of year, but you need to be very fit and well prepared. We plan to climb via a taxi to Bellevue to get started on the ascent to the Tete Rousse Hut. Next day the aim is to climb Mont Blanc and descend back to the Gouter hut with the last day being the descent from Gouter to the taxi at Bellevue. Our courses are priced on a ‘guiding only’ basis which means you just pay the cost price for all other expenses like hotels, mountain huts and lift passes.These expenses on average amount to about 600 euros which includes 7 nights half board accommodation in a hotel & the mountain huts. You could reduce this figure considerably if you wanted to stay in a gite or campsite and increase it if you want to stay in a more luxury hotel. Chamonix accommodation. Prices start from camping at C.15 euros per night, Bunkhouse for C.20 euros per night and hotel accommodation from around 40-50 euros upwards. Please see our Chamonix Accommodation notes. Mountain huts. Allow about 65 euros per person for your hut night (dinner, bed & breakfast) and share in the Guide’s hut night also (double this for the Huts on Mont Blanc, including several bottles of expensive drinking water). The guides hut expenses are split between the group members and these are heavily discounted in the huts. Insurance, this is your responsibility to arrange and ensure that you are covered for alpine mountaineering. For UK residents we recommend BMC insurance or see our Insurance FAQ here. £2975 for a 1:1 guiding ratio for the 6 day course with a bespoke strategy for each 3 day training & summit phases. £1595 per person for a private team of 2 doing an entirely bespoke 6 day course. 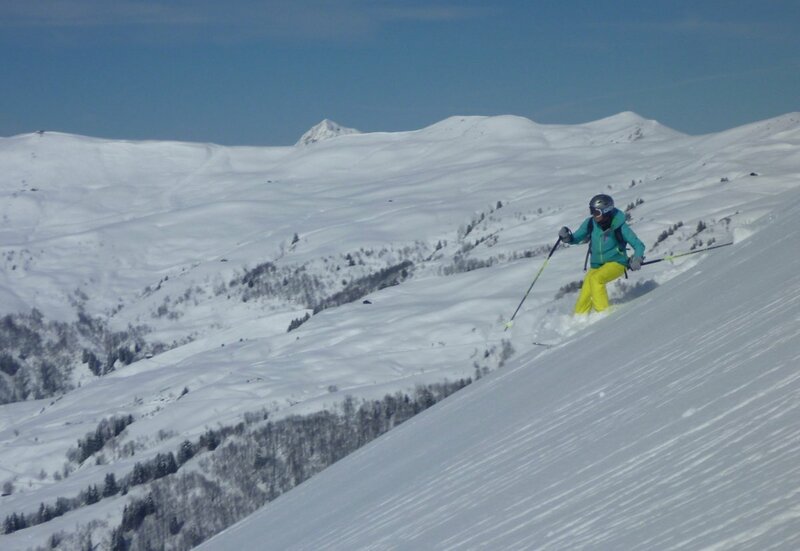 Our courses are priced on a ‘guiding only’ basis which means you just pay the cost price for all other expenses like hotels, mountain huts and lift passes. These expenses on average amount to about 700 euros which includes 7 nights half board accommodation in a hotel & the mountain huts. You could reduce this figure considerably if you wanted to stay in a gite or campsite and increase it if you want to stay in a more luxury hotel. Mountain huts. Allow about 65 euros per person for your hut night (dinner, bed & breakfast) and share in the Guide’s hut night also (double this for the Huts on Mont Blanc, including several bottles of drinking water). Thank you Rob and team for an unforgettable week. Everything was superbly organised and our guide Ben was outstanding – my climbing buddy Sarah and I had absolute trust in him. All the guides were great company. I will definitely be back for more adventures…. 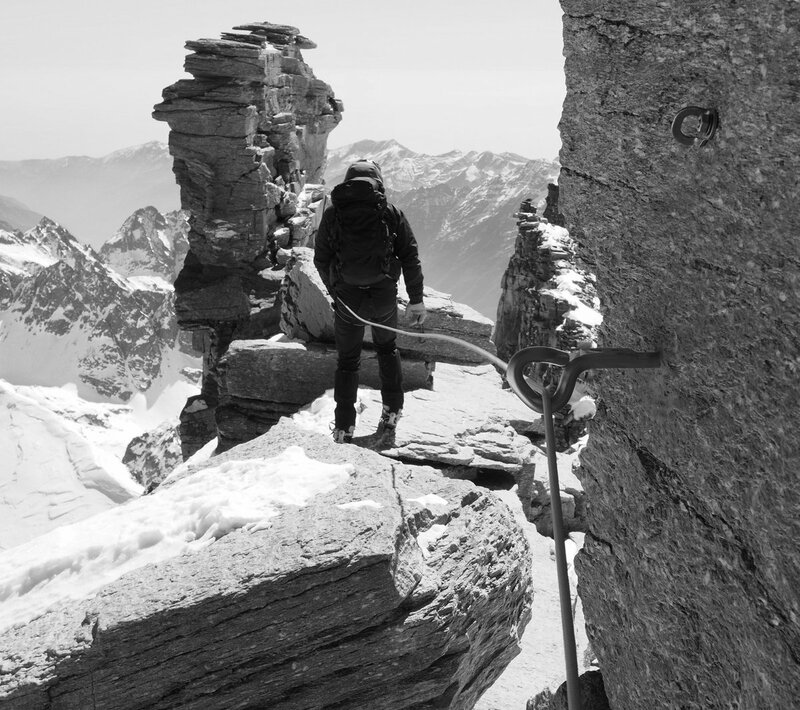 Gran Paradiso, Chamonix day trips – high altitude mountaineering if the weather allows, Chamonix Mountain Walking. Climb a 4000m peak in the Swiss Alps. 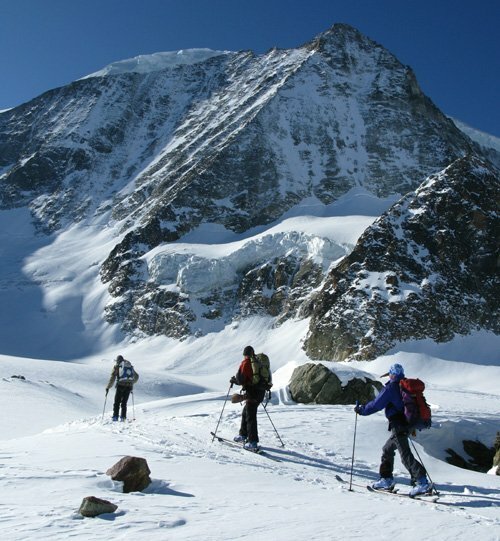 Visit the very high altitude glacier sanctuary of the Italian side of the Monte Rosa Massif. Rock climbing, Via Ferrata etc. 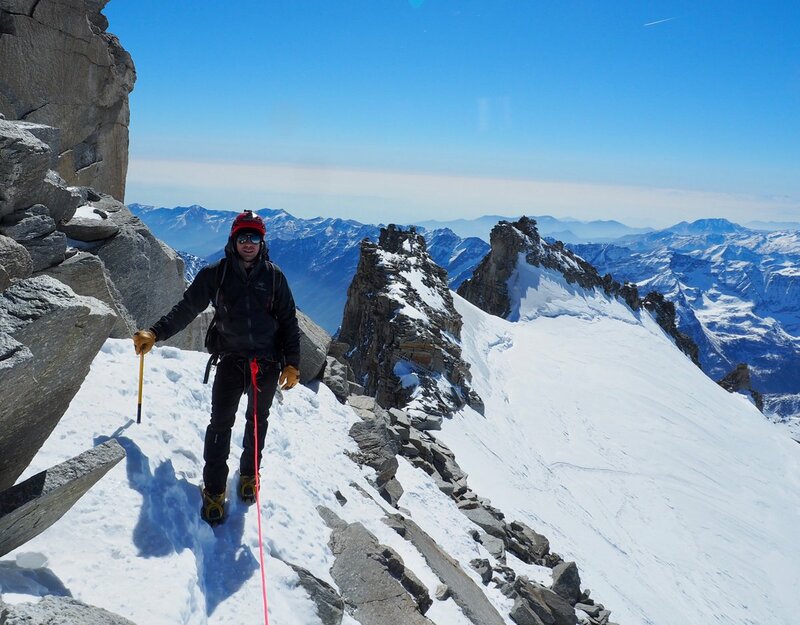 We have done many inspiring options as an alternative for a Mont Blanc summit period and generally folk have a great time doing this and very often come back and climb Mont Blanc on a future occasion in slightly better style as they are fitter, more experienced and understand more about what’s involved. There is also, contrary to the popular opinion of the ascent being a ‘Glacier Trek’ some rock scrambling up the West Face of the Aiguille du Gouter and this looks fairly impressive, intimidating even, when viewed from the Tette Rousse Hut. The scramble is however not as steep or hard as it looks. 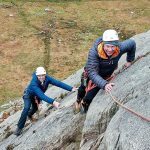 It is equipped with the odd bit of metal cable and, as long as the correct route is taken, not particularly difficult although icy conditions or poor weather can rapidly turn it in to a formidable mountaineering challenge. Once the Gouter Hut is reached the route above is all on snow & ice and is generally less steep. It is only after the crossing of the shoulder on the Dome du Gouter is reached that the summit can finally be seen, and it is not uncommon for folk to exclaim “Wow! Mont Blanc is a Big Mountain”. Big indeed and whilst the technical difficulties on this route are not great – the sense of scale and commitment when climbing this Giant of the Alps is well felt. The final ascent of the Bosses Ridge is slightly exposed, exhilarating and often, literally, breath taking both for the superb panoramic views and the cold thin air experienced at nearly 5000m! This route is generally less prone to avalanche danger than the ‘Trois Monts’ as the snow slopes crossed are both less steep overall and often on a ridge. This lends the additional advantage that often just one day of good weather is required to climb the mountain whereas some of the other routes will retain dangerous or poor snow conditions for longer after a storm, even during good weather. Despite the huge height gain offered to Mont Blanc climbers commencing their ascent with a ‘kick-start’ from the Aiguille du Midi lift, this route is by no means the easy option that its very high starting point (3800m) may suggest. 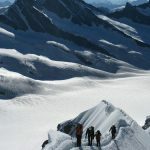 The traverse of ‘Les Trois Monts’ (the 3 peaks of Mont Blanc du Tacul, Mont Maudit & Mont Blanc itself) is a spectacular high alpine journey yet with that comes big mountain commitment with steep & sustained snow slopes and great exposure to the weather. On this route very good fitness and movement skills are required in equal measure along with knowledge of prevailing weather and snow conditions. Get it right and the rewards of this mountain journey are great but high above the Col de Brenva is no place to be caught in a storm and the crossing of Mont Blanc du Tacul may well not be a safe option after fresh snow. Avalanche risk on this route can be considerable both from the steep snow slopes crossed and the ice seracs hanging above. Whereas the main objective danger on the Gouter Route is stone fall in the Grand Couloir on this route it is ice fall and avalanches. The principal base for this route is the Cosmiques Hut at a lofty 3613m. Many folk will spend the night before and after the summit day attempt at the hut although fast parties can complete the climb by starting from the morning’s first Midi lifts – then either returning to the hut or continuing the traverse over the summit and down via the Gouter Route. 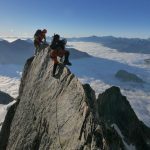 In completing the ‘Trois Monts’ route The vast majority of climbers do not actually visit the summits of Mont Blanc du Tacul and Maudit although a very fast party can do this during the ascent – always keeping a wary eye on energy levels remaining to complete the descent safely and swiftly. The initial long and weaving ascent of Mt Blanc du Tacul’s shoulder usually takes an intricate line around crevasses and seracs and would present difficult route finding without a track and in the dark if you were not familiar with the route. Once the shoulder is crossed the traverse to Col Maudit provides a welcome respite before the difficulties start again with the long & steep ascent to the shoulder on Mont Maudit. This culminates in a 50-55 degree snow & ice slope usually ascended as a couple of ‘pitches’ of climbing. Bare ice here can present difficulties although there are often in-situ fixed ropes in place of highly variable quality. Again the reward for these efforts is another traverse towards the Col de la Brenva. This feels like high mountain country indeed and the atmosphere only gathers on the final steep ascent of the Mur de la Cote. Above this, all that remains is a steady ascent via the easy but tiring upper snow slopes, often accompanied by heavy breathing in the search for oxygen and the junction with the Bosses Ridge, right at the summit of Mont Blanc. Folk seeking relative solitude away from the busier flanks of the normal routes on the French side are advised to head south, through the Mont Blanc tunnel and in to the immense glacial valleys of Veny, Miage and Dome. These are 3 huge glaciers that must be traversed in order to ascend the mountain from the wilder Italian side. This expedition has an almost Himalayan feel and there is the catch – the grunt factor! There is no mechanical uplift for the ‘Italian Job’, just a very long walk to the (lovely) Gonella hut (3071m) and an even longer ascent from there to the summit (12 hours round trip). The technical difficulty is no greater than the normal routes on the French side – but the physical factors of height gain, distance covered and time taken for the summit day are all that bit longer making the sum of the parts a big, rewarding and tough mountain journey. Monte Bianco’s southern approach route starts from the Italian Val Veny, just half an hours drive from Chamonix yet has the welcome advantage of relative solitude compared to the busy northern French flanks of the mountain. Despite this major attraction, the ascent is a long and physically tough undertaking and not for faint hearted…or weak legged! Crevassing above the Gonella Hut, on the Glacier du Dome, can also be an issue especially later in the season or during a poor snow year. However this is a high and magnificent mountain journey with an almost Greater Ranges / expedition feel thanks thanks to the huge glaciers journeyed over. Whilst any ascent of Mont Blanc is tough, this Italian route places greater physical demands on the climber than the French routes due to the absence of any lifts; long hut approach (5.5 hours) and even longer summit day (around 12 hours). Therefore it is even more necessary for folk attempting the mountain from this side to be extremely fit with and with excellent mountain endurance. This is only usually attained by actually spending long days in other hills and mountains and the Gym is not a realistic alternative to this. We arrange a 7 day course to climb Mont Blanc from the Italian side. This allows greater acclimatisation and flexibility than the standard course. It also allows a good training / warm up period in which some excellent training climbs can be completed. The Bionnassay looms over the Arve Valley / Geneva approach to the Mont Blanc Massif and is rightly famous for its superb long and exposed snow crest. This approach to Mont Blanc is the most technical of the 5 classic routes described here and provides a magnificent high level alpine traverse. The route could even be extended further when combined with a journey over the Domes de Miage, Mont Blanc & the Midi Plan traverse finishing down the Vallee Blanche. This would take a week! Acclimatised and fit parties however can complete the route in a 2 day round trip from the Valley. Whilst there are no lifts on the Contamines side of the mountain a taxi can be taken to the lovely Chalet de Miage. A coffee here provides an extremely pleasant start to the trek which also has an expedition feel as you start through lovely alpine meadows and steadily wind a way up to the Refuge de Plan Glacier. Lunch can be taken here whilst eyeing up the North Face of the Dome de Miage. Vow to come back and climb the Metrier Spur one day. It looks good. Our route up to the Durier Hut is less aesthetic yet equally direct. A rapid crossing of the Plan Glacier followed by a sustained and fairly ‘scruffy’ scramble up for afternoon tea at this small, cosy and superbly positioned hut, well run by local Contamines guardienne Manon. An early start is taken next morning so good snow conditions are found on the snow crests of the Bionassay and, besides, there is a long day ahead if Mont Blanc is to be climbed and descended. Another option would be to stay a 2nd night in the Tette Rousse, Gouter or Cosmiques Huts. At ‘AD-‘ the ascent of the Bionassay’s South Ridge is the most technical section of any route described here but it is not too hard for those familiar with other alpine AD routes, and the quality is high. Enjoyable snow & mixed scrambling up narrow ridges and chimneys. All engrossing but never too tricky if the correct line is taken. Quite suddenly the rocks give way to the perfect snow cone of the summit…and the sinuous connecting ridge over the ‘Pitons des Italien’ and on to the Dome du Gouter can be seen in all its glory. The difficulties experienced along the ridge are heavily dependent on snow conditions. Having both traversed hard ice whilst front pointing sideways along the ridge and cruised along in a fine track along a wide snowy ridge I can highly recommend getting some good info about current conditions before setting off! Either way the traverse of the Bionnassay provides a memorable mountain experience and the glittering additional prize of the Mont Blanc summit guarantees to have the hairs standing up on the back of the neck – with relief, satisfaction and elation all in good measure. Popular with ski mountaineers in the spring this route has rather fallen from modern fashion for summer climbers on Mont Blanc. It is a route with an interesting history as Balmat & Paccard climbed it in June 1786…..yes, that is 1786! 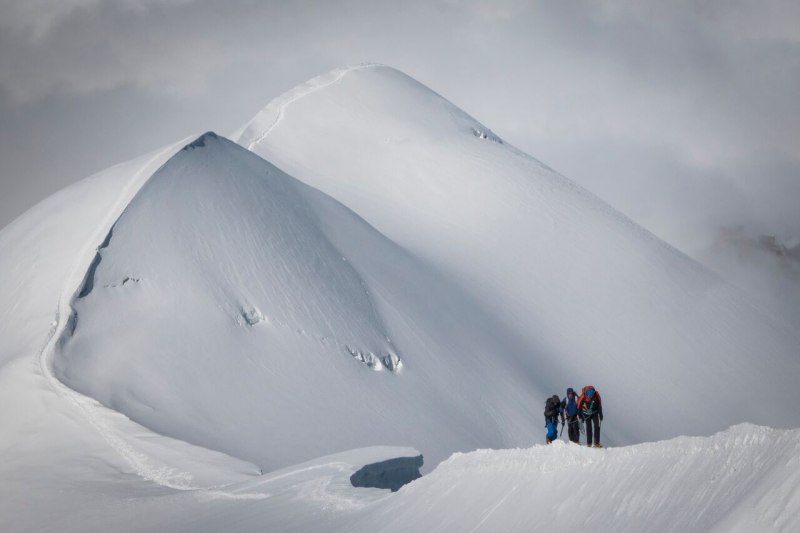 The pair went on to make the first ascent of Mont Blanc but with the North ridge of the Dome already done this gives it a legitimate claim to be the first high alpine climb ever done! The route is undertaken from the Grands Mulets Hut which generally remains open until mid-summer. Hut bookings are usually much less of an issue here than at the busier Cosmiques, Gouter and Tette Rousse Huts just around the corner. The journey from the Plan de l’Aiguille across the heavily crevassed ‘La Jonction’ glacier provides an engaging approach to the Grands Mulets Hut. Once in-situ with a cold drink on the Hut’s sunny terrace, a fine view can be enjoyed of the route above, which will be climbed during the night. After a vague lower glacier section the route narrows in to an excellent snow ridge – The ‘Arete Royale’. This includes a sustained 45-50 degree section which calls for a steady hand, not to mention solid calves! Good snow conditions are required here for a swift and enjoyable ascent but these can easily be checked with a pair of binoculars from Chamonix high street! The top of the arete gives way to easier angled glacial snow slopes and a shallow traverse leads to the junction with the Gouter Route at the Col du Dome, just before the steep ascent to the Vallot Hut. From here it is usually around 2 hours up the Bosses Ridge to the summit. Whilst the ascent route could be reversed back to the Grands Mulets many teams will prefer to continue the traverse either back over the Trois Mont to the Cosmiques or down the Gouter Route to the Gouter or Tette Rousse Huts. The ascent of the Petit and Grand Plateaus from the Grands Mulets Hut can not really be recommended due to the substantial objective dangers presented by the enormous hanging ice seracs situated above much of the route. Not content with being the highest mountain in the Alps, by some margin, Mont Blanc also has some huge faces giving long and exacting snow, mixed, ice and rock climbs. In addition to superlative alpine routes like the Peutery Integrale (longest in the Alps) and ‘Divine Providence (hardest in the Alps when first climbed in 1984) there are many other classic tough alpine mountaineering routes that logically lead to the summit of Mont Blanc. Some of these are desribed below. Most are from the Italian side as, unusually for the Alps, it is the South Face of Mont Blanc which presents the highest cliffs and greatest technical challenges. Along with the Gouter and Cosmiques this is one of the big three huts on Mont Blanc. In good high summer conditions the Tete Rousse can be easily approached in a couple of hours rough walking from the top of the tramway du Mont Blanc. However when the mountain is snowy outside the summer months, and the train / lifts are closed the approach is from Bionnay or Les Houches and is long and tough taking some steep terrain. A brand new hut will be opening in the summer of 2013. All the information and booking is on the CAF Gouter Hut website page. The Gouter Hut is another 2 hours above the Tete Rousse and the approach includes the crossing of the Grand Couloir and a lot of rough / rocky and mixed scrambling terrain. Whilst this has fixed cables in places the route finding needs care as straying off the route invariably means going on to loose ground with the danger of knocking rocks in to the Grand Couloir endangering teams below. 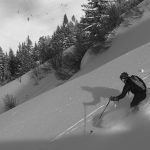 Situated in an impressive location above the Col du Midi and at the foot of Mont Blanc du Tacul and the Trois Mont route on Mont Blanc. The hut has a short but very high mountain / glacial approach from the Aiguille du Midi station including the famous ‘Midi Snow Arete’. The Cosmiques is a private hut open throughout much of the summer, early autumn and late winter in to spring. When closed there is no winter room but the nearby ‘Abri Simond’ Bivi Hut’ should be open (check in advance). Situated on a rocky outcrop surrounded by immense tumbling glaciers this hut certainly has an atmospheric location! It is usually accessed from the Plan de l’Aiguille mid station on the Aiguille du Midi cablecar. Now it is most often used for Ski Mont Blanc ascents due to the objective danges from the long glacial ‘Plateaus’ route. The North Ridge of the Dome du Gouter route however is close to this hut and this can provide a good early summer route also. All hut details on the CAF website – Grand Mulets Hut . This impressive new hut is situated above the huge Glaciers Miage and Dome and provides the base camp for the expedition up Mont Blanc from Italy. Gonella Hut website. A lovely tiny hut situated on the incredibly atmospheric Col de Miage on the French Italian border. This is a Club Alpine Francais Hut which has a guardian service (Manon) during good weather in the summer months. The approach via any route is long although a taxi can be taken from the Contamines Valley to access the Chalets de Miage. From here a days strenuous walk and then rough scramble accesses the hut which provides an excellent base for traversing the Aiguille du Bionassay. This is an emergency hut only and should not to be used as another hut on the ascent of Mont Blanc via the normal route. The hut is very basic and cold but does have an emergency phone and toilet and provides an opportunity to get out of the weather if caught high on the mountain in a storm. Book with a mountain guiding company and let them arrange the hut bookings on your behalf. Avoid the huts completely – by camping. There is an official ‘campsite’ area, with toilets, near to the refuge Tete Rousse. Camping is permitted here for a short stay. Camping is not allowed at the Gouter Hut or at the Col du Midi although there are invariably tents there in summer. Camping adds flexibility to the ascent and takes away the pressure of conforming to hut bookings. It is also cheaper and, at the Tete Rousse site, you could cook for yourselves or have dinner at the hut. However the additional pack weight is considerable. Carrying tent, sleeping bag, roll mat, stove, food and fuel is all heavy and will make the approach trek much tougher. Taking a tent to camp higher up the mountain is neither recommended or allowed. An ‘expedition’ pack like this is very unwieldy and slow on the more technical ground approaching the Gouter Hut and, once fit and acclimatised, a summit attempt can be made from a Base Camp at the Tete Rousse. To get the hut bookings you are after – plan well in advance (the winter before the summer of the climb) so reservations can be made early in the season. Climb Mont Blanc in the ‘off season’ outside the high summer months. Most, not all of the huts on Mont Blanc are owned by the Club Alpin Francais (CAF) and when they are not officially open (i.e with a guardian and restaurant service) always have a ‘winter room’ that can be accessed for shelter. These usually contain beds, blankets and pots and pans. They sometimes also have a stove with gas and occasionally wood burning stove. Details should be checked in advance with the local guides buruea / mountain office to clarify the status of the winter room before leaving so the correct equipment can be taken. After 13 / 13 to the summit of Gran Paradiso today the full MB course team made it 9/9 to the summit of Mont Blanc and are now recovering with a beer, dinner and a nights sleep at the Gouter Hut before continuing the descent past Tete Rousse, Nid d’Aigle and down to Les Houches Bellevue tomorrow morning. This is our preferred summit strategy to avoid descending the Gouter Ridge with tired legs / minds and crossing the Grand Couloir in the afternoon. Conditions on the Gouter Ridge are now pretty dry – mostly rocky and whilst there is still a snowy track across the Grand Couloir, there was also some reported stone fall later in the day. The snowy track above Gouter Hut was excellent and the team had the summit to themselves early this afternoon. Great to see Raina summit Mont Blanc last weekend after doing a couple of Mont Blanc training weekends with us in May 2018. The training paid off, conditions were good and the weather just held to allow a successful summit attempt between some quite stormy weather. Conditions remain very snowy as we head in to mid June and this represents an excellent start to the season in terms of cover on the glaciers. The Ridge up to Gouter is well snowy and a rising line was taken in a good track across the Grand Couloir and then enjoyable snowy mixed scrambling up the ridge. Slightly more exposed than when the ridge is dry in high summer but more enjoyable mountaineering and overall better conditions with less stone fall in the couloir! Higher up snow conditions are good with seemingly very good cover on the glacier and well bridged crevasses including the crevasse higher on the Bosses Ridge which has been slightly problematical in recent hot and dry summers. The Bosses Ridge itself was in great condition with a fine track. Lots of people taking advantage of conditions and the Tete Rousse Hut was full! 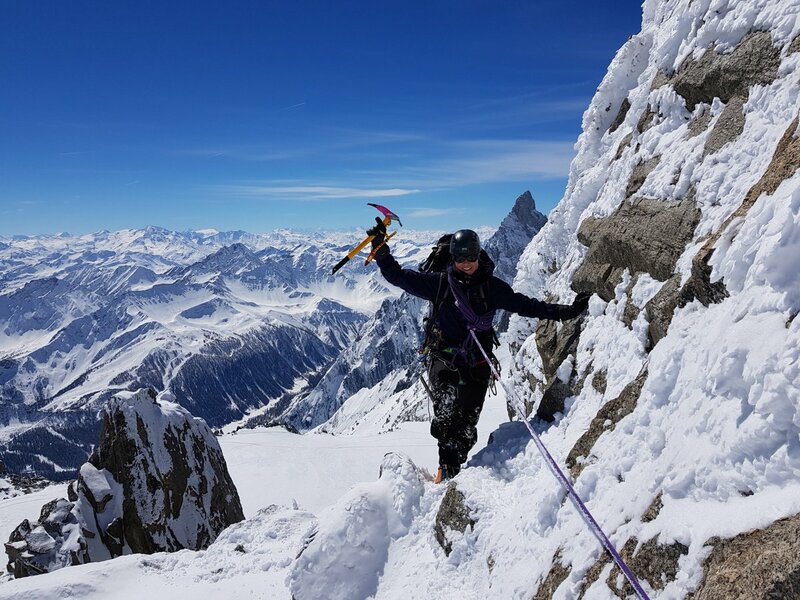 Raina descending Mont Blanc after her successful summit climb in early June 2018, after a couple of productive Mont Blanc training weekends with us in May 2018. Training is indeed performance enhancing! All five of our climbers reached the summit in great style this morning to be greeted by a chilly but beautiful early autumnal dawn across the high Northern Alps. The shadow of Mont Blanc was cast strongly down in to the shady Arve Valley over 4000m below. The descent was made steadily via a break at Gouter Hut and then the easy but long & rough walk back to Bionassay. A great day on the hill and very satisfying end to the summer season on Mont Blanc. Again showing that for the fit and well prepared late September can be a great time to climb. This is not our last course of the year as we will be trying again later in October so are hoping for an Indian summer then! Good weather has seen many ascents of Mont Blanc from both the Chamonix side – Aiguille du Midi / Cosmiques Hut and St Gervais side – Gouter / Tete Rousse Huts. Upper snow conditions have been fine but the late summer hot and sunny weather has led to a deterioration of the conditions in the Grand Couloir where lots of stone fall has been reported. Like last summer, even in dry conditions stone fall can develop due to hot weather and this has led the Prefet de Haute Savoie to issue a statement advising great care in the ascent via this route, paying particular attention to time of day and weather / temperature to assess the conditions. On the 3 Monts route the ascent to the shoulder on Mont Maudit is exposed to serac fall, currently looking unstable and the crossing of a tricky crevasse. As august arrives snow conditions remain good high on Mont Blanc with many teams enjoying the ascent from many different routes up the mountain. All the normal routes via Tete Rousse, Gouter, Gonella & Cosmiques have been climbed as as teams still climbing from the Grands Mulets hut via the North Ridge of the Dome du Gouter. There has been some stone fall in the Grand Couloir as usual but not as bad as last year when the Gouter Hut closed. Teams have also been climbing the Bionassay traverse and Inominata Ridge. A great alpine summer season so far! The first 30C day of the summer alpine season saw a big track extending from the Tete Rousse to the Gouter Hut and all the way up to the summit with many teams enjoying the good conditions and remarkably good early season snow cover. On the Italian side the Gonella Hut is now open but with no track leading above the hut, although one team are trying tonight. Two teams to the summit from the Tete Rousse Hut this morning, one from Montreal and one from Nottingham / Derby. Good snowy conditions and good going with a decent track in place. The approach to the Tete Rousse was made by the railway tracks and then normal route up the steep and snowy moraine ridge with the path well banked out in places. A long and brilliant day in good conditions, climbing a physical 3000m of ascent from Bellevue to the summit and down to the Gouter Hut in one day. We started via a taxi ride to Bellevue as all the lifts and trains are shut at this time of year. The Gouter hut was also closed but the winter room was open and provided us with a great little base camp for the climb. Snow conditions were good and there was a track from the steep ridge / path leading up to the Tete Rousse Hut. We eventually caught the Polish team who had made the track on the Dome du Gouter and then we were in to almost pristine snow conditions leading to the summit. One fast French climber had also made the summit that morning, from the valley up and down which was an impressively swift & stylish ascent. We steadily made our way up the Bosses Ridge in the early evening sun and topped out just at sunset with magnificent evening light. The windless night time descent was enjoyed despite the tired bodies and the chicken curry at the Gouter Hut went down well! 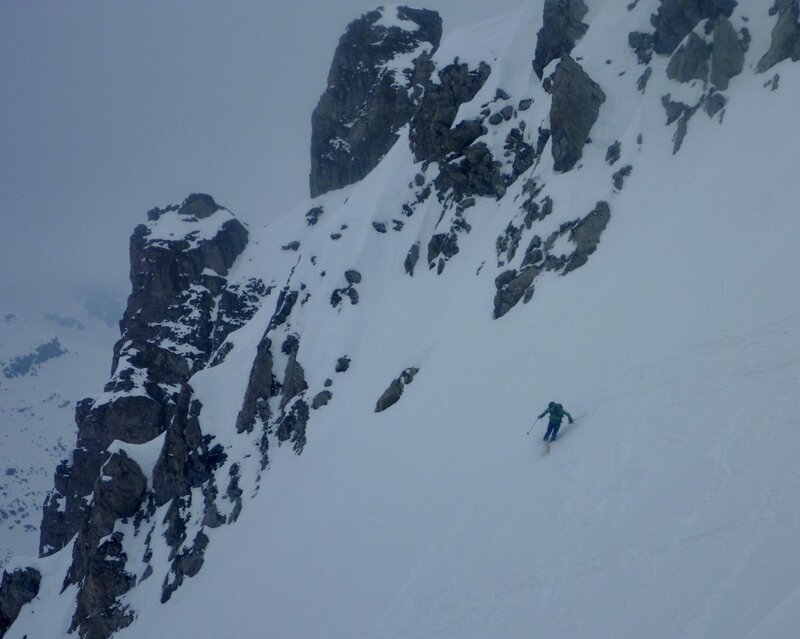 Next morning the Gouter Rib was descended in enjoyable snowy conditions with a good track now leading all the way down & across a pleasantly silent Grand Couloir. 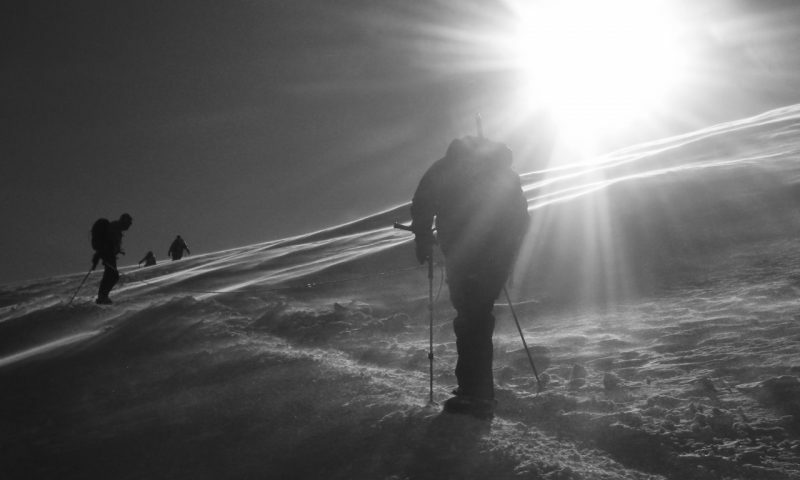 A great trip up Mont Blanc with tough but rewarding autumnal conditions. With several teams heading up the mountain and a good forecast for the next few days the track will become more established and conditions should remain good until the next poor / windy weather arrives. The Gouter Hut will remain open until mid October this year to make up for the weeks of closure during the high summer season. The extended season can be taken advantage of via the online hut booking system and there is even a reduction in price for the quiter October weeks. This can be a fantastic time to climb the mountain with tougher but quieter and often more pristine snow conditions. We already have one team booked in for a summit attempt during the 2nd week of October and look forward to the extra challenge presented by an autumn ascent of the mountain. Recent snow falls have added around 30cms of fresh snow at Gouter Hut / Aiguille du Midi height and this along with strong winds up high today will make for very difficult conditions from the Gouter and presumably no body climbing from the Cosmiques hut due to the elevated avalanche risk on the 3 Monts route. Cool, sunny weather is forecast for the next few days so teams from the Gouter Hut at least, will no doubt put the track back in all the way to the summit. The Gouter hut has re-opened after a month or so of closure due to the risk of stone fall in the Grand Couloir. We were paying close attention to the conditions and appreciated the recent fresh snow and general cooling of the mountain. The Grand Couloir had become dry again during the last couple of days of cool but sunny weather. Having spent a pleasant night at the Refuge Nid d’Aigle we climbed to the Gouter Hut via the crossing of the couloir mid morning. It was dry but calm and the ascent was incident free until we reached the old Gouter Hut where we helped with the rescue of a young woman who had broken her leg in a slip on ice behind the old hut. As the weather was really closing in with fresh snow on a stiff northerly wind, there was no helicopter coming and we used the rescue stretcher from the new Gouter Hut to effect the evacuation to the new hut. Conditions & weather above the hut were good next morning albeit with a continuing cold northerly wind and we were glad of our 2nd night at the Gouter hut meaning we made a leisurely ascent to the summit during the warmer part of the day. The weather again came in that night meaning the descent of the Gouter Rib the next morning was made in cold & snowy conditions. Enjoyable snowy scrambling and zero stone fall was noted in the couloir. Difficult conditions on the mountain at the moment. High stone fall risk in the Grand Couloir due to the extended heat wave and some tricky icy sections on the 3 Monts Route. We are currently planning some good alternatives for Mont Blanc teams arriving at the moment. Enjoyable ascent in excellent conditions from the Gouter Hut this morning & down to catch the train from the Nid d’Aigle in plenty of time on the last day of the season which the train is running. Conditions in the couloir are a little mixed and there was some stone fall late yesterday evening. Excellent snowy conditions high on the mountain – looks good for autumn! 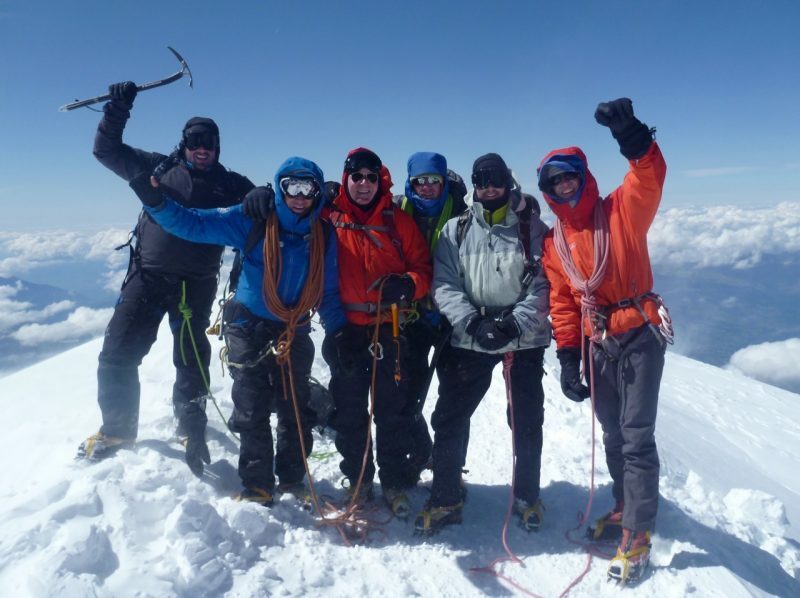 Well done to our 6 person Climb Mont Blanc team who are just down from a fine ascent via the Northern route on Mt Blanc. After a 3 day training period with ascents of the Weissmies & Allalinhorn the team enjoyed an easy day 4 up to the Tete Rousse Hut. 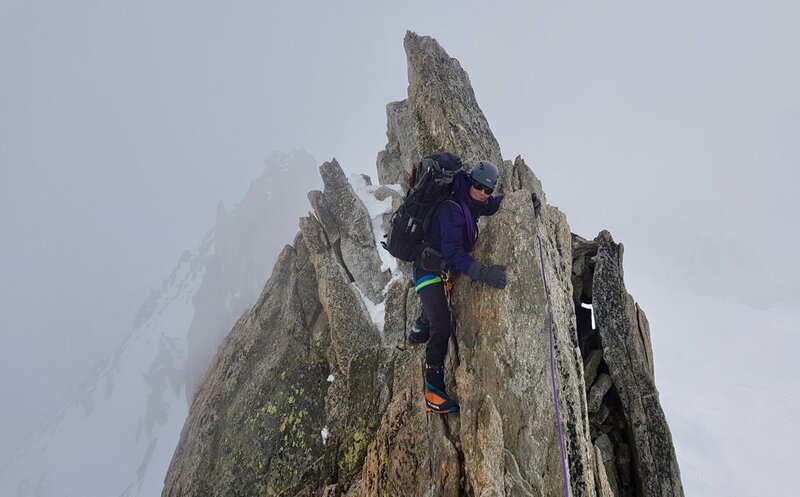 The summit day 5 is never ‘easy’ from the Tete Rousse – but with the knowledge of a bed booked at the Gouter ones time can be taken and the ascent & summit celebration enjoyed without the pressure of the scrambling descent and crossing of the Grand Couloir to negotiate. The final descent on day 6 is done with relatively fresh legs and a spring in the step. Concentration is required but the tramway du Mt Blanc is reached early on and all that remains is the rest of the day relaxing, recuperating & celebrating in Chamonix! Warm weather during the day but a reasonable overnight freeze up high and existing track gave decent snow conditions for the traverse of Mont Blanc via the 3 Monts route & down via the Gouter route. The ‘voie normale on Mont Blanc du Tacul has a fairly impressive looking steep wall low down on the ascent which is fortunately easier to climb than it looks! The upper tracks cut both hard right, as usual, to traverse round to the shoulder as well as there being a track in from the top of the triangle which teams were using both as descent from routes on the triangle as well as for the ascent of the Tacul. The track on Mont Maudit is also currently different to most seasons in that it climbs high on the north face before traversing out right to the ridge really close to the actual summit as opposed to the normal steep slope to the shoulder much lower down. Decent snowy conditions then from the Col de la Brenva, over the summit, along the Bosses ridge and all the way down to the crossing of the Grand Couloir which is still quite snowy. Generally fairly quiet conditions on the mountain but the huts are fully booked for much of next week. Our Mont Blanc courses are now full until September. Lovely warm autumn weather has taken the fresh snow line well back up the hill to nearly 3000m. Plenty of fresh snow remains above that but with a track already in place conditions were good on Mont Blanc today. A Polish team pushed high towards the summit but were forced to retreat in high winds. With snow forecast tomorrow there will be some more fresh down to 2900m with rain below that. The forecast for next week is looking pretty good! Just down from an enjoyable ascent of Mont Blanc via the Gouter Route and 2 nights in the new Gouter Refuge. The Grand Couloir was relatively quiet and crossed without incident late am on the way up, from the first tramway and early am on the way down, after a 7am breakfast at the Gouter. The upper mountain was in fine condition with an excellent track and well snowy conditions with almost no exposed bare ice. Many teams also came over the 3 Monts route from both the Cosmiques Hut and first Aiguille du Midi lift. One team even traversed the mountain from the first Midi lift to the summit and down to catch an afternoon train down from the Nid d’Aigle. Climbing Mont Blanc without a hut night – quite a novelty! As of the 7/8th of August a storm will have put down a fair bit of fresh snow and prevailing bad weather is preventing any teams summiting. However, on the Gouter route at least, this will settle quickly and with the return to good weather from Saturday the mountain will quickly come back in to good condition. 9th July 2013, Enjoyable Swift Ascent of Gouter Route & Excellent New Refuge! Unsurprisingly the new Gouter Refuge is a massive improvement on the old one. Smart, pleasant modern hut, smiling staff and good food were all a very welcome addition to our rapid ascent of the Gouter Normal route in near perfect conditions, at least higher on the mountain. The recent warm spell has stripped much of the snow from the Gouter Rib allowing the middle section to be climbed without crampons. A fair amount of snow has also been stripped from the Grand Couloir and, in response to the recently revealed rock / mixed patches, a few stones were seen flying down the couloir. We left the Gouter Hut at 0230 this morning and were on the summit not long after 0530. A good swift ascent from Andy putting us first on the summit and this, along with a thin layer of fresh snow, gave a real pristine feel to our pre – during and just post dawn ascent. The tramway du Mont Blanc is now on its summer time table with more trains and the last descent being 7pm. 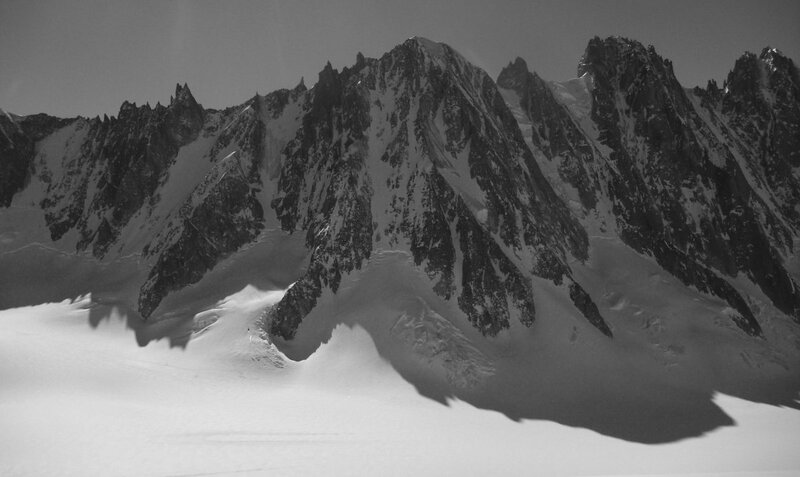 5th July 2013, Excellent Snow Conditions On All Mont Blanc ‘Normal’ Routes…. Teams were ‘making hay’ whilst the snow froze and stars twinkled this morning on most of the classic snow routes up Mont Blanc. A slightly frustrating day of weather watching at the Tete Rousse Hut yesterday was rewarded this morning with a perfect dawn and crunchy snow this morning. The wind had died down overnight and It was a pleasure to watch two head lamps bobbing their way up the NW Face of the Bionnassay during our steady ascent of the Dome du Gouter. 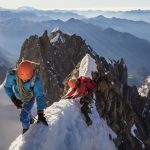 Teams were also cruising the classic snow arete of the Bionnassay and making classic traverses between the Italian Gonella Route and the Chamonix / Cosmiques Trois Monts route. The first day of July feels like it has ushered in the high summer season on Mont Blanc. A perfect summit day with a large track extending up from the Gouter Refuge to the summit, well seen all the way down the Arve Valley. Although the Bellevue cable car is closed for the season due to a fire which damaged the cables – the Tramway du Mont Blanc is open and can be taken from LE Fayet to the Nid d’Aigle. From here it is normally just a 2 hour walk to the Tete Rousse Hut although currently a bit longer with the large amounts of snow still around. Numerous recent reports have come in of significant rock falls in Mont Blanc’s Gouter couloir including a large one this morning which produced enough rock debris to spill out of the Couloir and down on to the Tete Rousse Glacier. The Tete Rousse camp / bivvi site has been closed and climbers are recommended to avoid this route for now as the very warm weather continues. Reasonable conditions are reported on the Cosmiques / Trois Monts route and more details of this to follow as we shall be attempting this route tomorrow. A week of perfect summer weather here in the Chamonix Valley is just coming to an end. 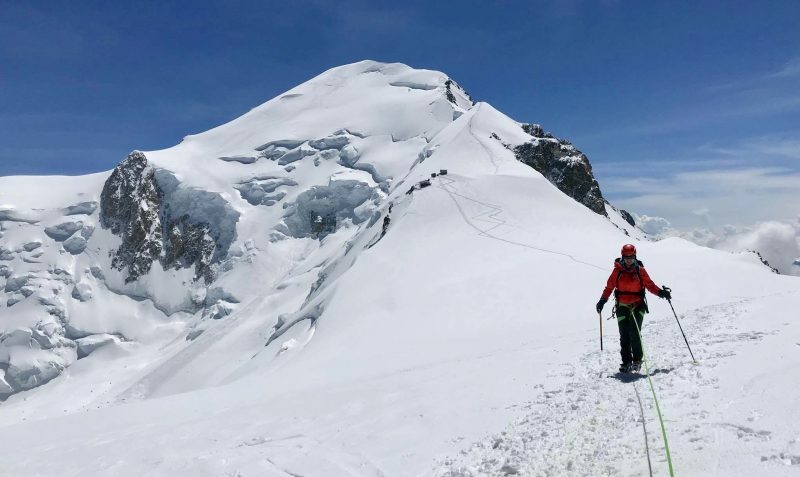 There are large tracks on both the Gouter and Trois Monts routes on Mont Blanc as well as teams reporting good conditions on the tougher traverse of the Bionassay. After a showery and cooler weekend it looks like things may set fair again for more classic summer summit weather next week. French Mountain Guide and celebrated alpiniste ‘Christophe Profit’ reported very good conditions on the North spur of the Dome du Gouter today and decent conditions to access the Grand Mulets Hut from the Plan de l’Aiguille across the ‘Jonction’. This elegant snow spur is often taken by skiers in spring bound for the summit of Mont Blanc and presents an aesthetic and relatively objectively safe route up Mont Blanc, as long as the Jonction can be negotiated which generally becomes quite complicated during the high summer. The Grand Mulets Hut is open until the end of July and provides an interesting alternative to it’s two more crowded alternative Mont Blanc ‘normal routes’ on the northern French side of Mont Blanc. The Gaurdian at the Gonella Hut is reporting excellent snowy conditions on the Italian ‘Monte Bianco’ Voie Normale right now. This is a long and physical but interesting alternative to the busier French routes and the hut is a lot easier to get a booking at too! 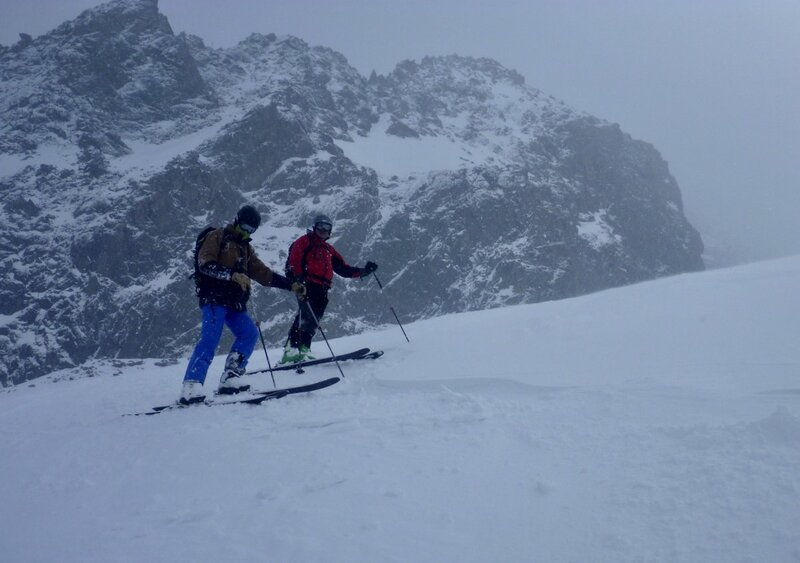 Excellent weather and good early season snowy conditions today both in the Grand Couloir and high on the Bosses Ridge. A perfect Mont Blanc summit day. After our experience of heavy trail breaking on the Gouter Route yesterday we were back up at the Col du Midi today enjoying the fresh, pristine conditions and making the most of our last day by doing some classic Chamonix Mountaineering on the Cosmiques Arete & Arete Laurence. The Cosmiques flank of Mont Blanc du Tacul was plastered in fresh snow and there were only a few tentative attempts at ascending it. One team did succeed in making a ski ascent of the face and later on a team on foot was working hard putting in a deep track in the fresh soft snow. No teams got higher on the Trois Mont route and no tracks could be seen crossing the Mont Maudit shoulder, across on the Gouter Route or looking down to the Grand Mulets hut and route via the North Spur of the Dome de Gouter. Our arrival at the Tete Rousse Hut yesterday coincided with the start of heavy downpours turning to snow around the altitude of the Hut (3167m). These would continue throughout the evening, night and in to this morning leaving around 15cm of fresh snow on top of a deep unfrozen base. A tough trail breaking combination! Our approach to the Hut was aided by Laurent and his 4X4 ‘Miage Taxi’ who took us from parking ‘Crozat’ above Bionassay to Bellevue. Walking around Mont Lachat from here we were able to then walk up the train tracks as it was a Sunday and no work was underway on the new tunnel. We met a couple of teams who had profited from yesterday’s excellent summit weather & conditions. This was not too be for us and after a slow trail breaking ascent to the Grand Couloir this morning, in deep soft snow, we turned around and made a speedy descent down in to the very wet and green valley. N.b the ‘echelles’ section of this ‘Are’ path from Bionassay to the Nid d’Aigle are not yet equipped. There are steps in place but no handrail. A few lucky teams enjoying fine early summer weather and summiting Mont Blanc today. Conditions reported as generally very good on the Trois Monts route although currently with a few very short but quite steep snow walls on the ascent of Mont Blanc du Tacul. Good to get the summit in today as it looks like the weather is taking a turn to cloudy, wet and quite windy for the next couple of days. Whilst the Gouter & Tete Rousse Refuges both open on the 1st June the track up Mont Blanc via this route is open already. A large ‘snow motorway’ could be seen above the Gouter Hut today as teams take advantage of the fine early season snow conditions and good weather. 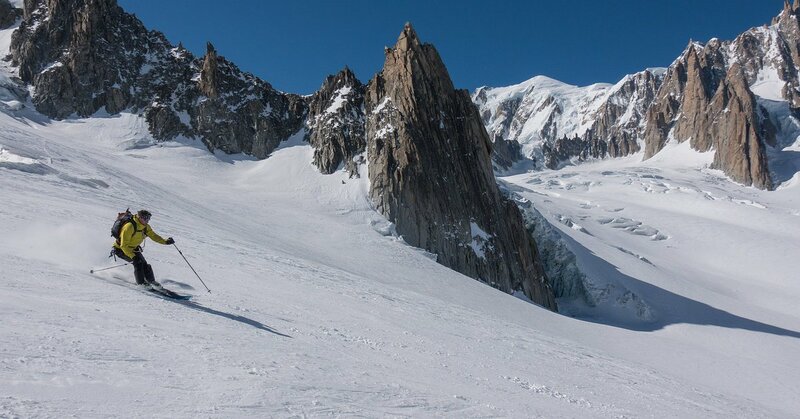 Many teams are also skiing the mountain from both the Grand Mulets Hut and Aiguille du Midi. Whilst the huts open in a few days time neither the Tramway du Mont Blanc or Bellevue ski lift will open for several weeks. This long approach from the valley lends a real expedition feel to the ascent and certainly helps to keep the crowds down! We reached just above the Vallot Hut in good conditions yesterday before running out of steam and a British party were evacuated from the hut by a PGHM helicopter rescue team. Today was a stunning and calmer summit day, but still cool. Many teams reached the summit. The meteo remains superb for tomorrow and another perfect summit day is on the cards. Note that there is a new section of cable at the very base of the Gouter rock rib once the Grand Couloir has been crossed in ascent. This is a bit steeper and a bit further right than before meaning that the cables (and people on them!) are less exposed to rock fall from the Couloir. There was also a long climbing rope in-situ across the couloir fixed to some new bolts at either side of the couloir. This was quite a handy addition but will presumably not last that long before it is trashed by rockfall. Bring on the Grand Couloir tunnel! After a rather ‘driech’ (Scottish for wet / grey / cloudy weather!) start conditions improved to a breezy but fine summit day (and the guides birthday!) with good conditions throughout the upper mountain. The Grand Couloir is getting a lot more mixed and the snow cover rapidly depleting. There were a number of rockfalls coming down the couloir by mid-afternoon, the time of our descent, however the soft snow was generally taking any momentum out of the rock fall and despite teams crossing coinciding with rocks falling no one seemed to get hit. Good to see Owen & Tim (British Guides) on the Bosses Arete who had made a long, tough trail breaking ascent of the Pope route from the Italian Gonella Hut. Finishing with a descent to the Cosmiques gave a long high level traverse of the mountain. A number of teams made the ascent from the Col du Midi and reported reasonable conditions but, as ever, worrying seracs on the ascent of Mont Blanc du Tacul. Fine conditions for our Mont Blanc ascent yesterday. An early breakfast was taken and we left the Tette Rousse at 0200 as heavy thunderstorms were forecast as likely for the afternoon. There was a good track across the Grand Couloir and we took crampons off for the lower section of the Gouter Ridge before putting them back on for the upper section to the Hut. The track above the Gouter Hut now goes well right on the initial open slopes of the Dome du Gouter North Flank Glacier. This is currently a good line as it avoids the very open crevassing further left. The slopes above and below the Vallot Hut were in good snowy shape with a decent track. We turned around on the Bosses Ridge due to tired legs in the team and just made it back to the Bellevue Telecabine before the storm truly kicked in at about 1600. The descent from the Tette Rousse was made easier by taking the snow slopes close to the Bionassay Glacier rather than the normal path, still some half decent bum slides to be had! 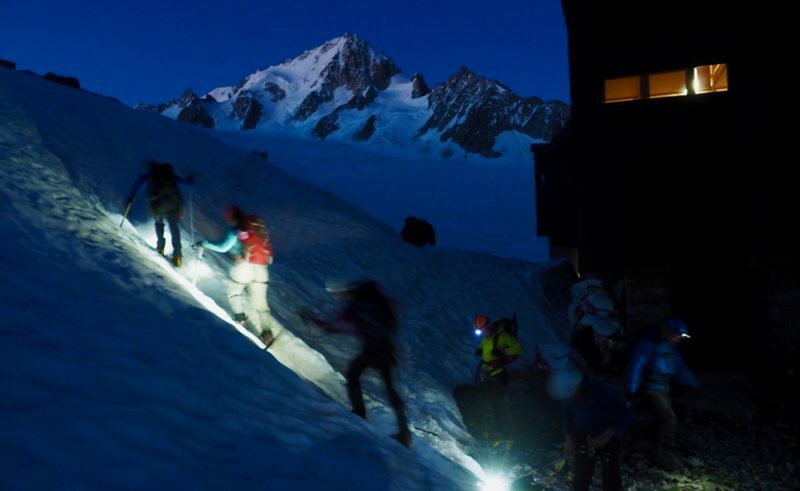 Some teams made the ascent of Mont Blanc from the Cosmiques Hut with at least one team completing the traverse. The ascent of the Dom went well from the amazing applestrudel at the Dom Hut to fine conditions and a big mountain atmosphere on the Festigrat. The large amount of vertical height gain on this climb (the highest of any alpine mountain summit from the valley – no lifts here!) took its toll and instead of undertaking the grueling ascent of the Monte Rosa we returned to Chamonix for some ‘Croissant and Café Alpinism’! Good effort guys…but the first successful completion of the Mission remains for the taking. Who shall step forward?